Show Your Support - Get Involved! 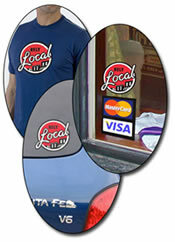 Don't just sit on the sidelines - show your support for Bend businesses and the RelyLocal campaign! We are the new "kid" on the block and need your help to connect more of our neighbors with local businesses! Our passion is to build a stronger community (online and off) and here are just a few of the ways you can show your support for our grass roots campaign to rebuild our local economy, (while shamelessly reminding businesses and customers to rely on one another). Around Town - Flash your RelyLocal Bling! Stay in the loop and join the conversation by clicking on any of our Social Networking links in the upper right corner. Not only can you interact with other loyal locals, but we'll keep you in the loop on everything from special events and promotions to history and information about local businesses. We will even run regular contests, giving friends and followers fun (and valuable) gifts from local businesses. Get connected! Link To RelyLocal! - Grab an Online Badge! One of the best ways to support the RelyLocal campaign is by linking to us with an official RelyLocal badge on your website. Below are several options to show your support. Please copy the supplied HTML from the boxes on the right and paste into your web site's code in the desired location. If you own or manage a local business, there is no better way to get involved than to become a RelyLocal member. Help new customers find you more easily, while getting more for your advertising dollars. Learn more or apply today!